Are you interested in finding a position in shipping and receiving? The first thing you need is a resume that showcases your experience and core skills. Keep reading for tips on how you can write a shipping and receiving clerk resume that will impress employers anywhere. New at writing one? If you’d like more assistance, we have a step-by-step resume guide that will teach you how to make your own. 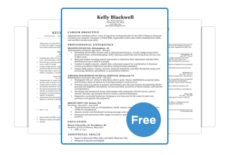 Or, if you’re ready to get it done immediately, our simple and free resume builder is another option. If this style isn’t what you’re looking for, check out our other varieties of resume templates for you to download. Is a shipping and receiving clerk not the job you want? We have samples and thorough writing guides for a wide range of occupations. 1. Is my career objective concise and clear? When you’re applying for a position, write your career objective with the particular industry in mind. It is integral that you don’t use the same one for every job application because each company is different. For a shipping and receiving clerk, your career objective needs to mention your warehouse experience in addition to any education or certifications you have. Original: IWLA Certified Warehouse Logistic Professional with 4 years experience in general warehouse operations, shipping, and receiving. Seeking a position at (COMPANY NAME), where I can offer my expert knowledge in shipping and receiving to make warehouse operations as smooth as possible. Possess an A.A.S. Tailored: IWLA Certified Warehouse Logistic Professional with 1 year experience in management and 4 years experience in general warehouse operations, shipping, and receiving. Seeking a position at (COMPANY NAME), where I can offer my expert knowledge in shipping and receiving to make warehouse operations as smooth as possible. Possess an A.A.S and a certificate in forklift operation. The original career objective is generic, while the tailored one adds information directly related to the job description. If you’re looking for entry-level positions, then put emphasis on any transferable skills that will be necessary for the job. For management positions, focus on customer service and communication skills since you will be using these more often on the job. There’s no “one size fits all” for a career objective, so tailoring it is a must when applying for any job. There’s more than one way to go about writing a career objective. Our complete guide on making the career objective is a great place to start if you need more help. 2. Is there a focus on licenses, certifications, and skills? For other careers, including numbers and statistics in the work history is a necessary action; however, most employers in the labor and warehouse industry will want to see an emphasis on skills and qualifications in the resume. Quantified experience is still helpful, though. Try to include at least one example of it in your own. Look at our sample for some ideas on industry-specific licenses & certifications to include in your resume. For this job, there are numerous licenses and certifications you can get that will make your skills section stronger. Job requirements often mention a forklift certification, so having one is a great advantage. As far as education goes, some employers may prefer candidates with an Associate or Bachelor’s degree, but a high school diploma will usually meet most jobs’ education requirements. Any clerical, production and processing, and customer service skills will be advantageous to your resume. If you’re serious about warehouse work or want to develop your career further, consider getting an IWLA Warehouse Logistics Professional (WLP) certification. Shipping and receiving clerks can move up to higher positions such as purchasing agents, whose main responsibility is buying products for a company. 3. Does my resume look visually appealing to employers? We’re not saying you should use colors or crazy fonts on the page. Your shipping and receiving clerk resume needs to look professional and clean, so keep reading for how you can make sure it fits this description. …it’s no more than one page long? …the font size is 12 pt? …you have lines and breaks for each section? …the margins are one inch by one inch? *For those with work experience, the Chronological format will work best and is an ideal choice for anyone seeking a job. If you have little work history, the Functional format will be best for highlighting your key skills. The Combination format is primarily for those applying for jobs that require a lot of certifications or technical skills, so this is another great option for experienced shipping and receiving clerks. After you proofread your writing and have someone else check over it, you’re one step closer to getting the job. If you want to be extra certain the appearance looks great, read our in-depth guide to formatting. Hopefully, after asking yourself these three questions, you have learned how to improve a resume ready to ship off to the hiring manager!